Findmypast is delighted to add the 1901 census to our Irish records. We’re always looking at ways to improve your search and the earliest surviving complete Irish census is a big one. For the first time you’ll be able to search all variations of a name and narrow your results by date of birth. You can also search for two members of the same household at the same time. So for example if you wanted to find Somerville and Ross, the authors of the Irish RM books, a search for the surname Somerville and a family member first name of Violet would find you Edith Oenone Somerville and Violet Florence Martin, the cousins behind the books. The 1901 census is a fantastic place to start looking for your Irish ancestors and a fascinating place to browse through. You can find key figures in Irish history like Patrick Pearse, educator and revolutionary who, in 1901 was a 19-year-old law student. Fifteen years later he would be one of the leaders of the 1916 Rising and read the Proclamation from the steps of the General Post Office. Also in the census is another name linked to the creation of the Irish state. In 1901 Michael Collins was just a 10-year-old school boy in Co. Cork. He would later be know as the “Big Fellow”, be a revolutionary leader, member of the first Dail, Chairman of the Irish Provisional Government and Commander-in-Chief of the provisional government army. He would fatally wounded in an ambush during the Irish Civil War in 1922. You can also find the more curious entries like the 13-year-old inventor Oliver Thomas Youell who was living in Ballinamore in Leitrim in the west of Ireland with his parents, six brothers and two sisters. 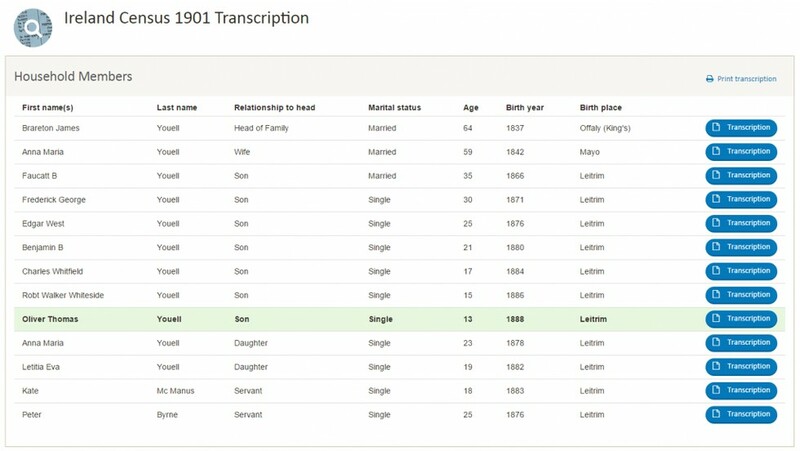 When you’ve found your ancestor in the 1901 census, why not try to find them in the 1911 census, also on Findmypast. You can use the same powerful search to give you more chance than ever before of finding who you’re looking for.